The Wheel Collider component is powered by the PhysX 3 Vehicles SDK. This tutorial takes you through the process of creating a basic functioning car. To start, select GameObject > 3D Object > Plane. This is the ground the car is going to drive on. To keep it simple, make sure the ground has a Transform of 0 (on the Transform component in the Inspector Window, click the Settings cog and click Reset). Increase the Transform’s Scale fields to 100 to make the Plane bigger. First, add a GameObject to act as the car root GameObject. To do this, go to GameObject > Create Empty. Change the GameObject’s name to car_root. 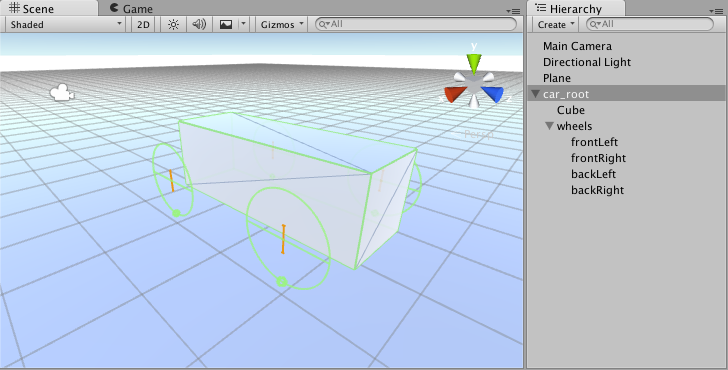 Add a Physics 3D Rigidbody component to car_root. The default mass of 1kg is too light for the default suspension settings; change it to 1500kg to make it much heavier. Next, create the car body Collider. Go to GameObject > 3D Object > Cube. Make this cube a child GameObject under car_root. Reset the Transform to 0 to make it perfectly aligned in local space. The car is oriented along the Z axis, so set the Transform’s Z Scale to 3. Add the wheels root. Select car_root and GameObject > Create Empty Child. Change the name to wheels. Reset the Transform on it. This GameObject is not mandatory, but it is useful for tuning and debugging later. To create the first wheel, select the wheels GameObject, go to GameObject > Create Empty Child, and name it frontLeft. Reset the Transform, then set the Transform Position X to –1, Y to 0, and Z to 1. To add a Collider to the wheel, go to Add component > Physics > Wheel Collider. Duplicate the frontLeft GameObject. Change the Transform’s X position to 1. Change the name to frontRight. Select both the frontLeft and frontRight GameObjects. Duplicate them. Change the Transform’s Z position of both GameObjects to –1. Change the names to rearLeft and rearRight respectively. Finally, select the car_root GameObject and use the Move Tool to raise it slightly above the ground. public bool motor; // is this wheel attached to motor? public bool steering; // does this wheel apply steer angle? Create a new C# script (Add Component > New Script), on the car_root GameObject, copy this sample into the script file and save it. You can tune the script parameters as shown below; experiment with the settings and enter Play Mode to test the results. You can have up to 20 wheels on a single vehicle instance, with each of them applying steering, motor or braking torque. Next, move on to visual wheels. As you can see, a Wheel Collider doesn’t apply the simulated wheel position and rotation back to the Wheel Collider’s Transform, so adding visual wheel requires some tricks. You need some wheel geometry here. You can make a simple wheel shape out of a cylinder. There could be several approaches to adding visual wheels: making it so that you have to assign visual wheels manually in script properties, or writing some logic to find the corresponding visual wheel automatically. This tutorial follows the second approach. Attach the visual wheels to the Wheel Collider GameObjects. One important parameter of the Wheel Collider component is Force App Point Distance. This is the distance from the base of the resting wheel to the point where the wheel forces are applied. The default value is 0, which means to apply the forces at the base of the resting wheel, but actually, it is wise to have this point located somewhere slightly below the car’s centre of mass. Note: To see the Wheel Collider in action, download the Vehicle Tools package, which includes tools to rig wheeled vehicles and create suspension for wheel colliders.